This watch had a double clasp on the bracelet and it is a good thing as one did not work. Fortunately I didn't not need the extra length or I would have returned this watch. The watch is pretty and I love the bracelet but am a little worried about the remaining clasp and how long it will last. For now I'm keeping the watch. 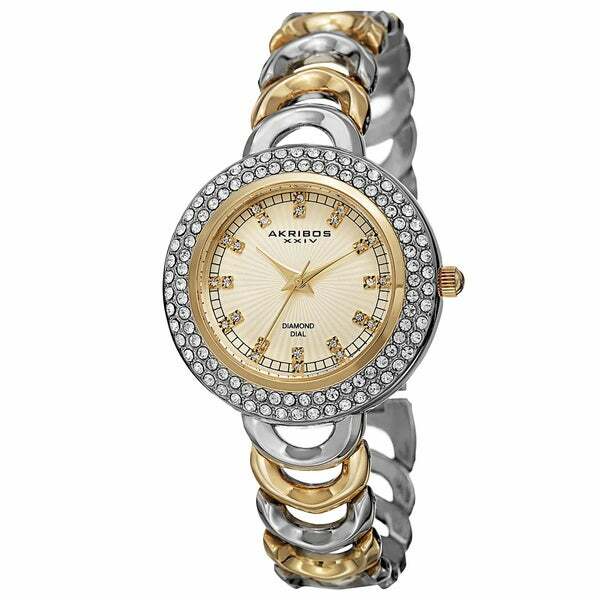 This dazzling Akribos XXIV women's watch features an open semi-circle link bracelet. This watch's sophisticated design includes long thin hands and a printed pattern dial. The sparkling diamonds and crystals enhance its chic look and create a glamorous effect. "is the watch face a large one or is it medium sized ? i have a small wrist and don't want it overwhelmed." The case diameter is approximately 36 mm wide and 9 mm thick.